Please complete and submit this form along with proof of your 501(c)(3) status at least 45 days, but not more than 6 months, prior to the event. The appropriate party will contact you if we're able to accommodate your request. Due to the large volume of requests we receive, we reserve the right to decline support or participation at any time. Baked goods must be picked up on the day of the event to ensure freshness. Please finalize pickup arrangements with the Corner Bakery Cafe Manager. ARE YOU A NON-PROFIT ORGANIZATION, SCHOOL OR CHURCH WITH ONGOING FUNDRAISING NEEDS? If so, we may be interested in discussing our community fundraiser program, in which Corner Bakery Cafe* donates a percentage of sales generated from the event back to your organization (*available at select locations). Who is the contact in charge of ongoing fundraising for your organization? DOES YOUR ORGANIZATION HAVE ANY CATERING NEEDS ON THE DAY OF THE EVENT OR THROUGHOUT THE YEAR? If so, who is the contact responsible for placing orders? 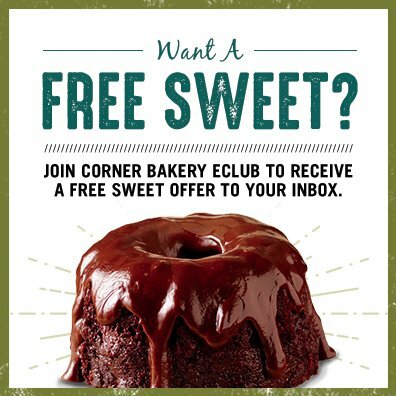 For approved requests, we'd love to take advantage of any promotional opportunities you're able to offer Corner Bakery Cafe. Please request a copy of our logo and approval for use. If you use our name on its own (verbal/written), please use "Corner Bakery Cafe". We respect our privacy and will never rent or sell your information. Must be 18 years or older to join/participate. By providing your email address, you are opting-in to receive email from our company and you many ask to stop receiving email from us at any time.